The counterfeit pharmaceutical industry has been valued at over one billion dollars and continues to provide the market with imposter medications that are poor quality and potentially harmful to patients. This problem is especially prevalent in developing countries where up to 60% of medications have been found to be substandard. Tests to analyze potential counterfeit drugs are often expensive and require lab equipment, which may not be an option in low-resource settings. Weaver’s graduate research has focused on tackling this problem by developing an inexpensive analytical tool that provides a chemical profile of a pharmaceutical without lab equipment. 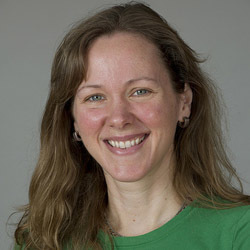 Working with Marya Lieberman, associate professor of chemistry and biochemistry, and the Paper Analytical Device (PAD) project research team, Weaver has helped develop and optimize a paper-based test that can provide a chemical profile of a pharmaceutical. The test is run on chromatography paper that is pre-loaded with chemical reagents that respond to specific chemical structures with color producing reactions. 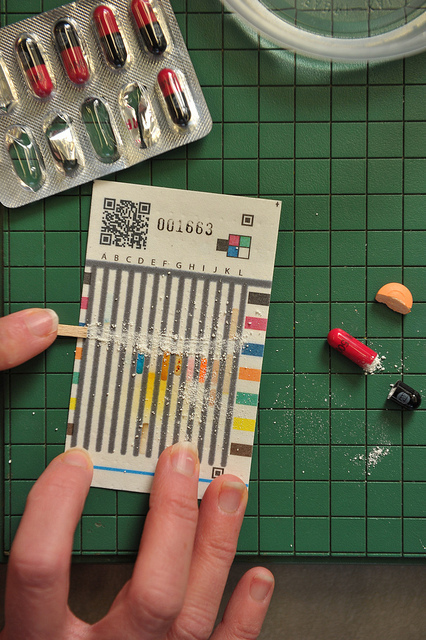 The pharmaceutical is swiped across the paper test card and the card is set into a small amount of water to run. The water carries the chemical regents to the pharmaceutical sample, producing a color bar code. The bar code is then compared to color bar codes of authentic pharmaceuticals to determine whether or not the sample is substandard. Weaver has collaborated with the Food and Drug Administration (FDA) to test the technology against known counterfeit drug samples and she has also trained pharmacists in Kenya to use the test. The Baxter Young Investigator Award program aims to stimulate research applicable to the development of therapies and medical products that save and sustain patients’ lives. Accepted categories of research include instrumental and analytical sciences, life sciences, medical device engineering, and pharmaceutical sciences and the program is open to graduate students and post-doctoral fellows in the Midwest. Originally published by Stephanie Healey at science.nd.edu on September 25, 2014.